Tropical grasslands, also known as savannas, consist of grasses, shrubs and a few trees in large areas between the rain forest and the desert. Savannas primarily exist near the equator where the warm, dry climate strongly contributes to the plants that grow there. Savannas can be found in East Africa, South America and Australia. where a variety of highly specialized plants have learned to live with long periods of drought. A thorny tree reaching 50 feet tall, the senegal gum acacia (Acacia senegal) thrives in sandy areas of the African savanna where less than 15 inches of rain falls each year. The tree sports lots of branches with thorns that appear in pairs as well as grayish-green leaves with yellow or cream-colored flowers that grow on spikes. Once the flowers fade, brownish-yellow seed pods growing up to 8 inches long and 3 inches wide mature. The tree oozes a sap between December and June that is used to make gum Arabic for medicinal purposes. The plant provides shade, habitat and nesting sites for a host of animals and birds. Kangaroo paw (Anigozanthos manglessi) grows in Australia’s savanna. The name comes from the bright red ovary and paw-shaped flowers the plant produces. Kangaroo paw features green furry flowers attached to thick red stems. The flowers grow to 4 inches long, while the stems grow to almost 3 feet tall. Tiny, woolly hairs grow on the flowers, making the plant taste unpalatable to possible predators. Birds such as honey eaters and wattle birds perch on the stems to sip the nectar from the flowers while helping pollinate the plant. The baobab tree (Adansonia digitata) grows to 70 feet in height and almost as wide. Found in South Africa and other tropical African countries, the tree can live for several thousands years. 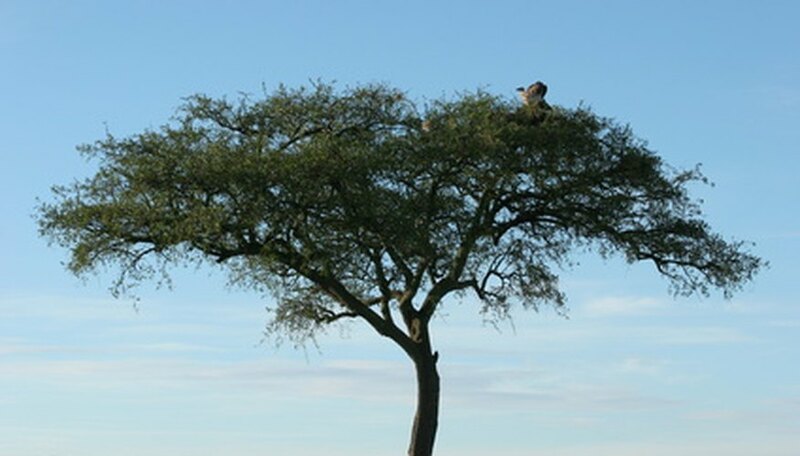 The tree survives the drought season on the savanna by producing leaves only during periods of rain. Otherwise, the tree looks dead the other nine months of the year. During the short wet season, large fragrant white flowers bloom in the afternoon, only to fall off within 24 hours and become quite stinky. Large, egg-shaped fruits appear next, with the interior of the fruit containing a dry, powdery substance that when soaked in water creates a drink similar to lemonade. The tree stores water in its thick, fire-resistant trunk to help it survive the long dry period. Aboriginal people use the baobab’s bark for cloth and rope, while the leaves are used for condiments and medicines. People also eat the fruits, called monkey bread.